Every new book from Martha Stewart is cause for celebration, and with Martha Stewart’s Baking Handbook, she returns to bring the pleasures of baking to readers at every level, from beginner to expert and beyond. 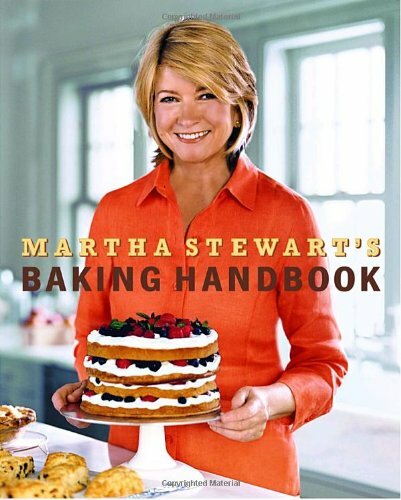 A culinary compendium packed with more than 200 foolproof recipes for the best baked goods, Martha Stewart’s Baking Handbook takes readers by the hand and guides them through the process of creating an irresistible variety of cakes, cookies, pies, tarts, breads, and much more. This essential addition to every cook’s library is rich with tips, techniques, and the mouthwatering and stunning recipes for which Martha Stewart is so well known. Covering a delectable array of topics from simple to sophisticated, including biscuits, muffins, scones, cookies, layer cakes, specialty cakes, sweet and savory pies and tarts, and pastries and breads, she provides a dazzlingly delicious yet crystal-clear, vividly illustrated repertoire of recipes. There are cakes that are elegant enough for formal occasions, such as showers, weddings, and dinner parties, and basic favorites meant to be enjoyed every day and then passed down through the generations. Every chapter includes indispensable visual equipment glossaries and features vital make-ahead information and storage techniques. Organized for maximum clarity and practicality, the handbook also offers step-by-step how-to photographs that demystify even the most complex and nuanced techniques. These culinary building blocks will turn good bakers into great bakers, and make great bakers even better. Filled with time-honored classics, such as Marble Cake with White-Chocolate Glaze, Apple Pie, Challah, Baba au Rhum, and Croissants, as well as lots of new surprises, Martha Stewart’s Baking Handbook will be reached for again and again, no matter the season or occasion. Martha Stewart has always drawn inspiration from her surroundings. Raised in Nutley, New Jersey, in a family with six children, she developed a passion for cooking, gardening, and homekeeping in her childhood home on Elm Place. Her mother, a schoolteacher and homemaker, taught her the basics of cooking, baking, canning, and sewing; her father, a pharmaceutical salesman and avid gardener, introduced her to gardening in the family’s small but orderly backyard garden when she was 3. While earning a bachelor’s degree in history and architectural history at Barnard College, Martha worked as a model to pay tuition. She married in her sophomore year, and upon graduating, she became a stockbroker on Wall Street, where she gained business training. After moving to Westport, Connecticut, in 1972 with her husband and daughter, Alexis, she developed a catering business that was unlike any other. The business’s unique visual presentation of food and the elegant recipes created for various catered events were the basis for her first book, “Entertaining,” published in 1982.